International Overdose Awareness Day is an annual awareness day held in many countries around the world. It honors the memory of people who died from drug overdoses. The main goal of this observance is to raise public awareness abound drug overdoses as one of the leading causes of death among drug users, as well as emphasize the importance of their prevention. Drug overdose, also known as simply overdose or OD, is the ingestion of a drug or other substance in quantities greater than are generally practiced or recommended. Many drug overdoses are accidental, but they can also be caused intentionally as self-harm or to commit suicide. Among overdose victims, there are many people who used illicit drugs of unexpected purity, in large quantities, or after a period of abstinence. 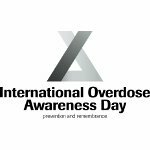 International Overdose Awareness Day was initiated in 2001 by Sally J Finn at The Salvation Army in Melbourne, Australia. Since 2012, the event has been coordinated by the Penington Institute, a non-profit Australian public health organization that strives to enhance awareness of problematic substance use and to respond to specific drug use problems and their causes. International Overdose Awareness Day activities are held all over the world, from Afghanistan to Russia to the United States. They include solemn remembrance ceremonies dedicated to drug overdose victims, lectures, seminars, demonstrations, and more. These events are organized and supported by numerous governmental organizations and NGOs.